A babymoon is defined as the “period of time following the birth of a baby during which the new parents can focus on establishing a bond with their child.” So, then, what is a babymoon album? For the sake of this piece, we’re defining it as a record made by an artist who, at the time of the album’s production and/or penning, had recently become a parent. I, the author of this list, am certainly not a parent. I cannot fully grasp the unshakeable love a mother or father has for their children. But, I do know that becoming a parent changes everything, and, for an artist, those changes can apply to their music, too. Parenthood might give an artist not only a new perspective on life, but also on music and what it means to make it. This year, first-time parent Chan Marshall (a.k.a. Cat Power) shared her first new music (an LP, Wanderer), since welcoming her son to the world in 2015. Wanderer is warm and embracing, so it’s fitting that Marshall’s son is pictured at her side on the album’s cover. Another recent parent, Phosphorescent’s Mathew Houck, shared new music this year in the form of his seventh studio album, C’est La Vie. In the five years since its predecessor, Muchacho, Houck met his wife (who also joined his band), moved to Nashville and had two children. Those are all major life changes, but that last one is a biggie, and you can hear the extra love and care woven into Houck’s latest record. Perhaps the most famous parents in music (and probably the world), Beyoncé and JAY Z are hitmakers and influencers with stellar records to spare. Only Beyoncé’s eighth album, though, can stand as her first post-Blue Ivy release. 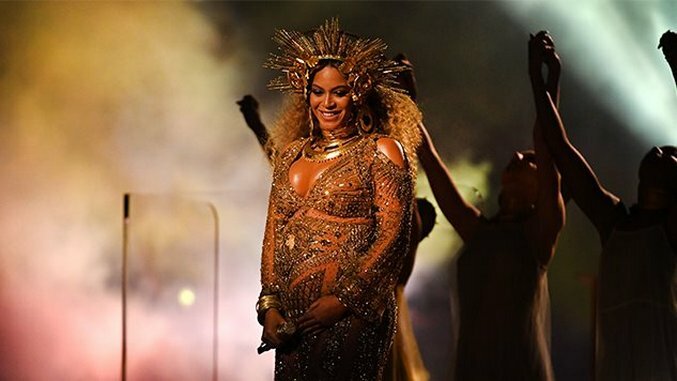 From her landmark duet with JAY Z on the deliciously explicit “Drunk in Love” to her soaring rendition of “XO” (which John Mayer later famously tackled) to Frank Ocean’s empowering cameo on “Superpower,” this LP harbors some of Beyoncé’s most iconic moments, which is saying a lot (she’s Beyoncé.). “***Flawless” immediately became a self-love anthem upon Beyoncé’s release, and it’s still a staple at gyms and salons and parties everywhere. And the trap-happy “7/11” is a delirious display of energy that’ll make you want to move and groove. Chan Marshall, who records under the alias Cat Power, boasts more musical prowess than many singer/songwriters would even know what to do with. In fact, after nine gleaming LPs, she almost stopped doing anything with it—she told The New York Times that after getting pregnant in 2014, she thought about abandoning her music career to move to Australia and change her name to Beth. Instead of fulfilling those outback fantasies, Marshall went back to work. The result is her 10th LP, Wanderer, a marvelously minimalist, generously arranged and smartly written glance into one woman’s mind. Marshall allows Wanderer to be about lots of things at once: such life-altering instances as motherhood and death as well as plentifully covered topics like love and relationships. Cat Power has stumbled at times during her lengthy and storied career, but on Wanderer, she gracefully lands on all four feet. Beck has said the only reason he decided to release “Wow,” the wacky power-pop single from 2017’s Colors, is because his two kids liked it. In an interview with Vanity Fair Beck called the song a “sonic doodle.” But Guero, Beck’s other most pop-forward record, also replete with much sonic scribble-scrabble, was concocted when his son Cosmo was still an only child—less than a year old, at that. While it shares some of Colors’ happy-go-lucky hues and stomps, Guero was the first time Beck released an album as a parent. He abandoned some of his indie slacker sensibilities for mindfully produced acoustic pop, all while implementing lots of Latin flair. This could be the babymoon record to trump them all. When LCD Soundsystem announced they were calling it quits in 2011 (and performed a now-famous farewell concert at Madison Square Garden), fans were definitely not expecting their return in 2017. In the years following that mythical MSG finale, frontman James Murphy got married and had a baby. Only after those life-changing events did the band make a comeback with the splendid American Dream, an urgent, awesome dance-punk manifestation rivaling LCD’s output from their glory days in the early aughts. They toured the record (including a lengthy Brooklyn residency), released some Spotify singles and even announced another album, Electric Lady Sessions, due out later this year. A band once deemed extinct is thriving once more, and perhaps that’s in part due to Murphy and his newfound experiences as a parent. Whatever the case, we’re happy they returned. Both a married couple and songwriting partners, Jason Isbell and his fellow 400 Unit member (as well as a stellar solo songwriter in her own right) Amanda Shires became parents in 2015. Since then, they’ve both released great solo albums (For Isbell, Something More Than Free, just a few months after their daughter’s birth, and for Shires, 2016’s My Piece of Land and this year’s excellent To the Sunset) and last year’s The Nashville Sound as a band. It’s on the latter, though, where they display some of their strongest songwriting skills yet, especially on the duet “If We Were Vampires.” Another album standout, “White Man’s World,” begins with a prayer for Isbell’s daughter: “Under our roof is a baby girl / I thought this world could be hers one day / But her mama knew better.” Isbell has always been an empathetic songwriter, but when it comes to his child, he’s able to summon even more feeling. Though he would later pen one of the most endearing familial love songs ever for his wife and child in the form of “I Need My Girl,” The National frontman Matt Berninger first addresses his daughter Isla on 2010’s High Violet, which was recorded and produced shortly after her birth. Berninger’s anxieties about becoming a father fueled album standout “Afraid Of Everyone.” “With my kid on my shoulders I try / Not to hurt anybody I like,” he sings. Berninger mostly avoided writing about fatherhood until 2013’s Trouble Will Find Me, but on High Violet his experiences as a parent were new and fresh—He feels the need to protect his family, defending them with his “orange umbrella.” However, when listening to rock music, Berninger doesn’t want to hear artists sing about their children (or so he said in this interview), but it sounds pretty great when he does it. When Bob Dylan released Planet Waves in 1974, he’d been out of the public eye for eight years while on a touring hiatus. During that time, he also had four children with his wife Sara. The song Dylan wrote for his son, “Forever Young,” is one of his most well-known, and it carries some of the most touching messages a parent could hope for their child: “May your heart always be joyful / May your song always be sung / And may you stay forever young.” The song’s lyrics and the phrase “forever young” have since taken on a host of new meanings, but their first iteration was pure and tender. “Forever Young” is a timeless prayer, and it remains one of Dylan’s most affecting tunes. Though the magnificent The Miseducation of Lauryn Hill isn’t remembered as a babymoon record, it was technically written following the birth of Hill’s first son, Zion, and there’s an ode to him to prove it. “To Zion” is about Hill’s fears and anxieties and overwhelming joy surrounding her pregnancy and her son’s birth. She’s in awe at this “crazy circumstance,” remembering how everyone urged her to think of her career and “use your head” when she got pregnant. But then Hill sings, “I knew his life deserved a chance,” and the song that follows is a celebration. A gospel choir echoes her words as Hill sings “The joy of my world is in Zion!” Like the entirety of The Miseducation of Lauryn Hill, which is remembered as one of the best albums of 1998, “To Zion” is jubilant and reflective. While Lauryn Hill’s masterpiece record is lauded for lots of reasons, this track wouldn’t have been possible without her becoming a mother.